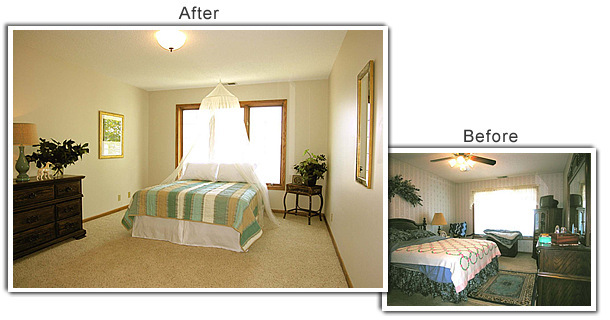 The project: A master bedroom suite in a two-bedroom Waconia condo. What worked: A beautiful view of the lake, ample closets and a private master bath. What didn't: Too much furniture, a dated ceiling fan and country wallpaper that made the room feel small and dated. "Summer is the best time to sell anything on the water," said Lori Matzke of Centerstagehome.com. "We wanted to emphasize that appeal." To bring light into the room and give potential buyers better views of the lake, Matzke removed the valance, shades and screens. Because the condo is on the third floor and faces the lake, privacy was not an issue and window treatments were unneccessary. Now, the window looks much larger and has greater visual impact. Clutter on the dresser, extra blankets, the small TC set and a dried floral arrangement above the bed were boxed up. Eliminating the area rug creates a more open flow. A white bedskirt and pillowcases keep the bedding simple. To emphasize that this condo is on the lake, a $29.99 fishnet canopy give the space a cabana-like appeal. It also softens the light coming through the window without blocking the view. A vintage mirror reflects light back into the room. Edit furnishings to make the room feel more open and airy. Ditching the headboard and attached dresser mirror gives the room an even more spacious feel. Wallpaper can be a turnoff for potential buyers, especially if it's dated and/or doesn't fit the buyer's style. Matzke gave this room a coat of fresh paint in a soft neutral shade. A dated ceiling fan was a distraction, so Matzke replaced it with a ceiling light with soft marbled glass that coordinates with a new pendant light in the dining room. Always consider the buyer's view from the entrance to the room. A large dresser was the first thing buyers saw from the doorway. Matzke moved it to the opposite wall and put the bed 12 inches in front of the window to make the room feel more spacious. Messy, faded bedding draws negative attention to the bed, so Matzke bought a striped quilt for $50 with colors that reflect the colors of the lake and beach. To draw the buyer's eye around the room, Matzke put a silk arrangement in the corner and fresh cut greenery on the dresser. A $19 lamp ties together the color scheme. Gold-framed artwork and a colorful Monet print add color while keeping the theme consistent. The owners replaced the tired carpeting throughout the condo with the same neutral color and style to give the space a more open and consistent flow.